Executive brainstorming in the Wild Angler conference room. Continuing education pays dividends. Dr. Ernie Schmidt during a corporate retreat. Would your company like to incentivize top sales managers or innovators? Are your executives overdue for a corporate retreat, yet you find them less than enthusiastic? Want to break down barriers and foster a sense of collaboration, dialogue and creativity? Considering a professional or academic conference in Queenstown or Dunedin? 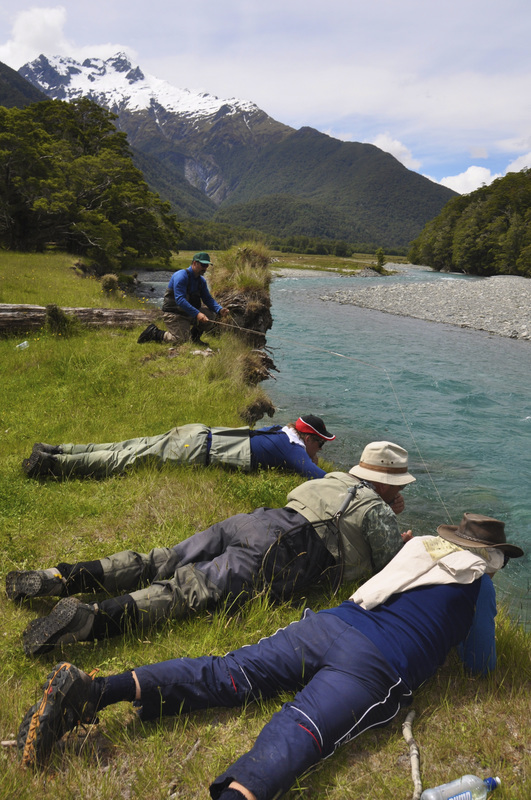 New Zealand is world famous for its unique style of sight fishing. The method parallels many of the same activities of corporate best practice. Two anglers walk up different banks of a river, assisted by a guide, and take turns spotting and casting to trophy trout. Individual success depends on trust, collaboration and generosity rather than isolated effort. Like start-up entrepreneurs eyeing market opportunities, each angling team member has a unique perspective on the challenge presented by every bend in the river. Scouting new pools and interpreting light and shadow teaches you to balance logic and intuition. Pairs can work with each other for the retreat's duration. Or you can mix up the pairing to encourage greater group awareness of individual talents and creative approaches. There's nothing more team-building than returning to the lodge in the evening for drinks and dinner and stories from the day on the river. The entrepreneur as hunter-gatherer. Corporate fly fishing retreats offer something for both men and women. Experienced guides will tell you women often learn fly fishing just a quickly--if not more so--than their male counterparts, as the sport rewards those unafraid of asking questions and applying subtlety rather than brute force. Wild Angler corporate services can arrange all-inclusive lodging and dining options, as well as space for corporate events. Accommodations can be rustic or luxurious, with venues in Dunedin, Queenstown or more remote locations. A corporate fly-fishing retreat may also be tax-deductible, depending on where you live, if you discuss educational and professional advances during the trip. Let us know what you'd like to experience. We can design a custom package fine-tuned to your corporate and personal needs. "I brought a group of over 20 anglers and partners from abroad to fish the Southland waters, including the famous Mataura River and its tributaries. On that trip, I engaged Casey Cravens of Wild Angler as our head guide and organizer for the entire week. In addition to guiding us, Casey arranged all the local guides as well as accommodations, spousal events and evening social venues. As president of PPS (Pacific Professional Seminars), I have organized angling travel events all over the world, including 6 other trips to New Zealand). I can tell you that this was, by far, the best organized trip we have had for many years. Certainly, the best we’ve had in New Zealand. Notwithstanding weather, our trip was a huge success. Guiding was very professional and all guides engaged provided excellent local knowledge as well as high-quality tackle and flies. Our anglers ranged from the highly skilled to rank amateurs and each was able to meet their expectations for the fishing trip. "I would be thrilled to recommend Casey to any other corporate group for all the hard work and the excellent trip he created for us. I’d love to hear from you and would happily consolidate your confidence in taking Casey to handle your group’s needs. Dreading another boring corporate retreat? ​Book one you'll remember. Contact Wild Angler today.